Round tubing plugs can be used in a variety of applications, such as creating an attractive finish to patio or office furniture. 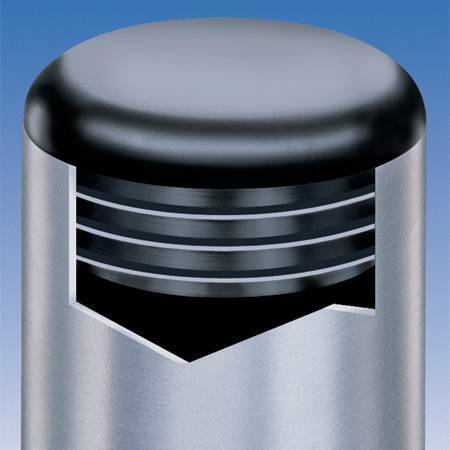 To ensure a tight lock on end products, unique "ribs" are implemented into the design of round tubing plugs to grip tight on the inside, providing a sure fit when accommodating a wide range of tube gauges. Tubing Plugs are extensively in the office and commercial furniture industry as well as display fixtures and similar metal products. The material of our round tubing plugs is low-density polyethylene. Standard color is black. Description Made from low-density polyethylene, round tubing plugs create a crisp, finished look at the end of any tubing. Round tubing plugs are excellent for uses around the home, including capping off patio furniture or other exposed tubing. The standard color is black, but Harman can customize these products according to your needs.